high-precision manufacturing & ample features + adjustment options. 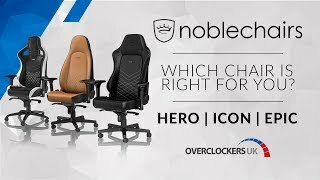 Avant-garde office chair brand noblechairs raises the bar up high by bringing you its impressive EPIC series swivel chairs pioneering the world's first gaming chair featuring valuable and exceedingly durable real leather covering. Their equally well-equipped faux leather siblings are made of 100% vegan polyurethane (PU) with similarly outstanding characteristics and a 25 per cent higher material thickness of 1.5 millimetres. This unique PENTA Sports Edition in black-orange has been made especially for fans of the PENTA Sports eSports team and thus features the famous clan's own branding. It comes with orange seams along with a black logo patch with white embroidery and its easy-to-clean black artificial leather is nicely framed by orange faux leather stripes. The entire range of noblechairs' classy gamer seats shares the same stellar German design that strikes a perfect balance between luxury car-inspired appearance and materials as well as idiosyncratic gamer chair styling and ergonomics descended from racing car seats. The resulting discreet design without garish colouring creates an air of noblesse and renders the noblechairs gaming chairs simply beautiful. The chairs' elegance is furthered by many loving details like the white debossed PENTA Sports logo that crests the headrest above an elliptical noblechairs aluminium emblem with relief lettering which adorns the backrest. The rear of this special edition also features white PENTA Sports logos on the headrest and backrest. The breathable imitation leather cover possesses an intriguing surface texture that emulates real leather perfectly and is embroidered with a gorgeous diamond pattern stitching. Such sovereign adjustment options and flexible ergonomics render the noblechairs the most sophisticated gaming chairs available on the market. To adequately support the neck area and lumbar region, two removable pillows with SK Gaming logo are included with every unit. 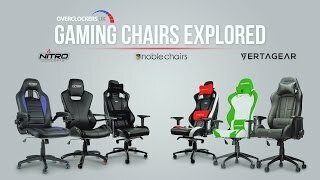 Thanks to their unrivalled set of properties combined with long-awaited innovations, the EPIC series gaming chairs are not just suited for gamers and pro gamers, but for virtually everyone who craves for a truly comfortable office chair with chic design made of superior materials and produced with utmost quality. More links for "EPIC Gaming Chair - PENTA Sports Edition"
This is an awesome looking chair which also happens to be very well made, it's very firm, comes with two support cushions for head and lumber support and has a great range of adjustability from the arms to the fully reclining position. It's very stable so there is no wobble like my previous chair had. Also very happy with customer support, this chair arrived with damage to the arm so I contacted Noble immediately to complain and they had a new one delivered 3 days later.......excellent service.